Babadunjo is a professional dancer, choreographer, and costume designer. 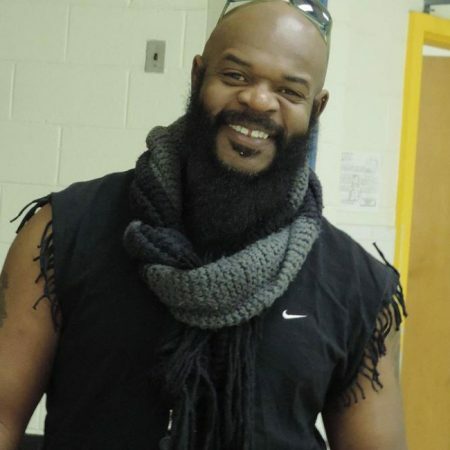 He currently is the co-director of The Ezibu Muntu, the Director of Ngoma African & Contemporary Dance Company at University of Richmond, and Color Guard Instructor at Deep Run High School and Lee-Davis HS. Has worked closely with Baba Chuck Davis (Durham, NC) and danced with Baba Melvin Deals’ African Dancers and Drummers (Washington, DC). He is also a member of The Dzifa Masquerade Fraternity. Among these many talents he has also had the opportunity to travel to Senegal, West Africa as a dance liaison. He is also a performer with Carolina Gold Drum and Bugle Corps, Rocky Mount, NC for 8 years. Since at Carolina Gold, he has received Most Outstanding Performer 2003 and has held the captain leadership position 06, 07, 08. Mr. McCain is a past member of The Light Brigade World Winterguard Philadelphia, PA for 3 years. He received Most Valuable Member 2006 and Co-Captain 2007. Babadunjo has over 20 years of experience African Dance. His educational background includes study at the Virginia Commonwealth University (VCU) with a degree in Physical Education and a minor in Dance/Choreography.